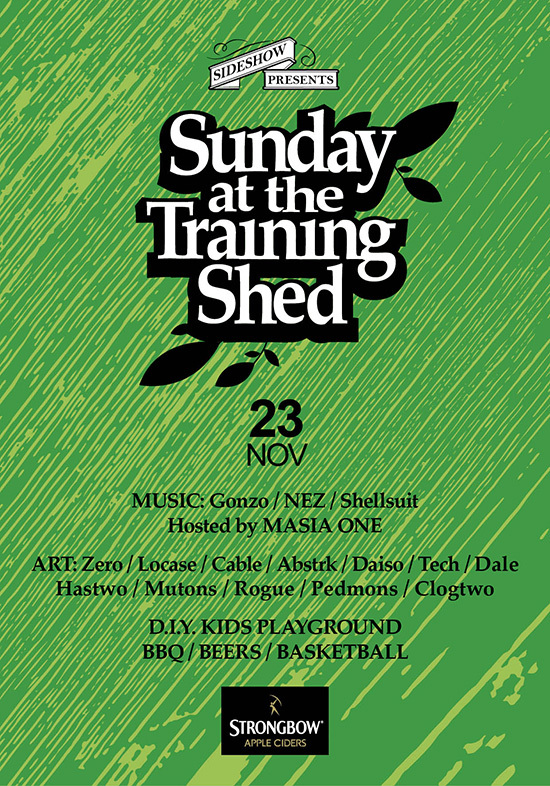 The final Training Shed party for 2014! Music from Gonzo, NEZ and Shellsuit with MASIA ONE on the mic. Live graffiti including a Graffight showdown where artists showcase their styles by writing their opponent’s tag name. Plus – D.I.Y. cardboard playground and chalkboards for kids, bbq and cold beers, and our new addition – a basketball net for all the b-ballers out there. Dress to sweat! This edition is kindly supported by Strongbow Apple Ciders – look out for some great deals on a variety of flavours. No outside food and drinks please – we rely on your custom to keep the party rolling.